California and Steller sea lions travel 145 from the mouth of the Columbia River to Bonneville Lock and Dam to eat returning adult salmon as they enter the fish ladders. Sea lion are a major source of salmon mortality when they prey on migrating fish at the dam’s fish ladder. 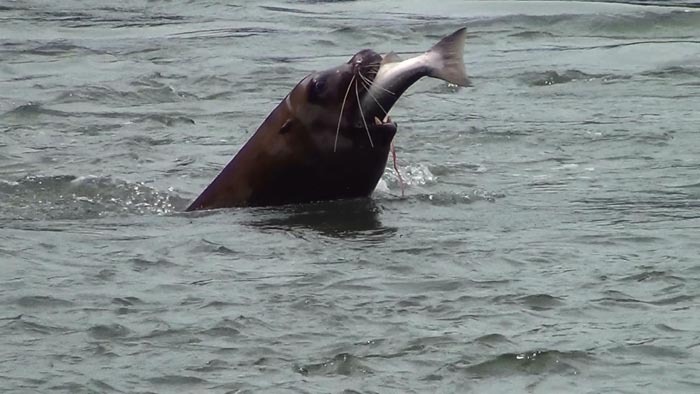 In 2008 NOAA Fisheries authorized Oregon, Washington and Idaho wildlife authorities to begin trapping and removing sea lions shown to repeatedly prey on salmon at the dam. The removal program was designed to reduce impacts on protected salmon. Photo courtesy U.S. Army Corps of Engineers. Since 1975, when the California sea lion population was estimated at 88,924 animals, their numbers have boomed, and it is estimated there are now approximately 257,631 animals. 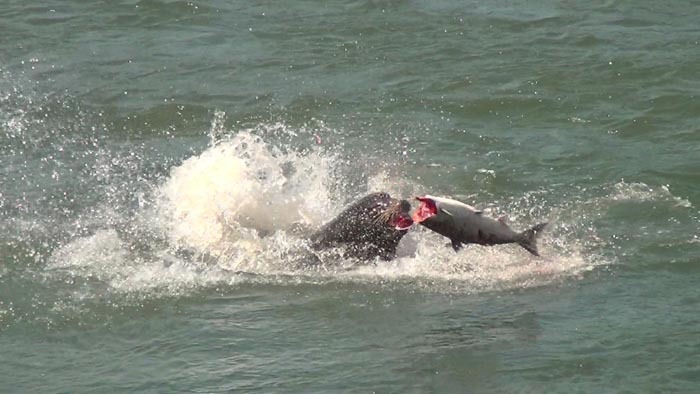 The growing population of sea lions is having a negative impact on salmon and steelhead returns. At Bonneville Dam, from 2002 through 2018, (California sea lions, Steller sea lions, and harbor seals) have consumed an estimated 71,000 salmon and steelhead, representing 0.35 percent (2002) to 5.5 percent (2016) of the total salmonid passage. According to these trends, we are concerned continued predation at such rates could drive at least some of the threatened and endangered salmon and steelhead runs to extinction.